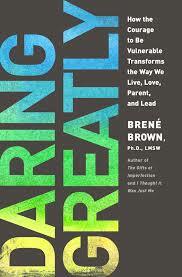 a book chick: "Daring Greatly"
my take: I also read I Thought it was Just Me and The Gift of Imperfection by Brené Brown this year and was less than wowed. Or less than connected, and if you've read her, Ms. Brown is all about connection. I think I finally got it. As she was using excerpts from her other books, I started realizing I'd missed the important stuff. For whatever reason, this book made the most sense for me and helped me connect the dots between shame and vulnerability and how they play out in life. And lots about WORTHINESS or lack there of in one's mind. Practical, insightful, helpful, ah-ha moments galore. My kind of read.